How To Connect Dominant 7th Guitar Arpeggios in blues. 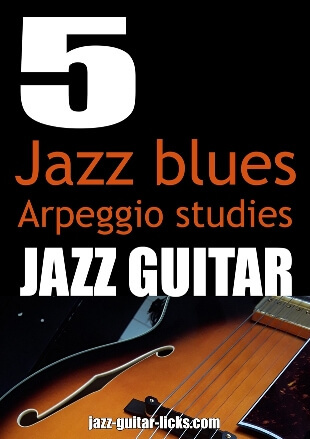 An arpeggio is a chord whose notes are played one by one, it is a chord played like a scale. Playing them in your guitar solo will outline the harmony of the tune. It will give your improvisation a sense of direction, making your jazz lines more beautiful, more melodic, more interesting to listen to. How To Use Arpeggios ? The first rule is to play the arpeggio corresponding to a chord. For example, playing a D minor seventh arpeggio over a Dm7 chord or a G dominant 7th arpeggio over a G7 chord. You can also use them to add color to your solos by using arpeggio substitutions and superimpositions (playing an arpeggio different from the chord). For example, a Bm7b5 arpeggio over a G7 chord. This way you will highlight the 9th of G7. There are many possibilities. 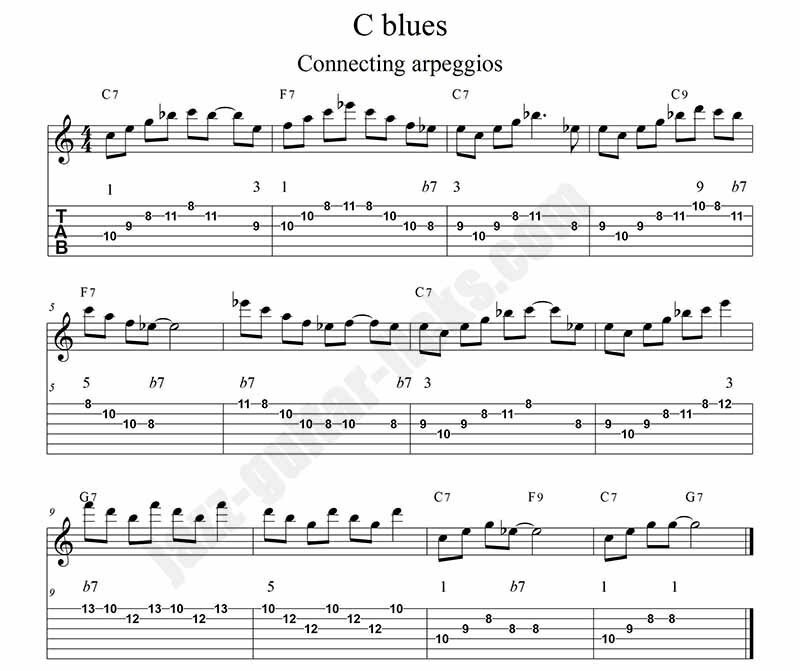 This lesson is an example of how you can use and play arpeggios in blues. We consider a standard dominant Blues in C. The chords in the simplest form of a dominant Blues in C are C7, F7, and G7. To spice up this basic 12-bars blues progression we will add two dominant 9th chords which are C9 and F9 chords in bars 4 and 11. Most beginning guitar players when faced with soloing over blues chord progression usually use the familiar minor pentatonic scale with the blue note added (b5). That's a good choice, but it sounds too "bluesy", don't outline the harmony and can be rather limited at the long run. How To Connect Dominant 7th Arpeggios ? When you want to play fluid and melodic lines using arpeggios, it is important to connect them. The distance between the connected notes should not be higher than 2 semitones. Example with the bars 1 & 2 of the C blues below. We will play two dominant 7th arpeggios, respectively C7 and F7. They are connected by the third (E) of the C dominant 7th arpeggio and the tonic (F) of F dominant 7th arpeggio. The distance between E & F is 1 semitone, the process of linking two notes close to each other produce a fluid sequence. Another example, in bars 4 & 5. The minor seventh (Bb) of C7 is connected to the fifth (C) of F7. Once again Bb and C are separated by 2 semitones. You can also connect notes using a semitone, this is the case between Eb and E in bars 6 & 7, respectively minor seventh of F7 and third of C7.